As far as I know the Dussack was widely used during the 30 years wars, especially troops from Bohemia or Southern Germany. Are you asking if the wooden training weapon was used in combat? If that's your question then the answer is no. Wooden weapons are for training not killing. A person who couldn't afford a steel sword would not fight with a wooden one (Musashi Miyamoto aside). In the Medieval era the poor didn't fight. This has been discussed here before, recently, for instance in this thread. Chad, do you know if that is a training weapon or one with a good edge on it? I don't read German, so I don't know (it comes from a German book). Any chance you could post the description?.....I'm sure someone could do some quick translating. This picture is from Czech book (Šach, J.: Chladné zbraně. Aventinum, Praha 1999.) translated in german. Dussak or Dusseke is from Czech Tesák. Very common wearpon for farmers, artisan and military folk (shooters..) in medieval in central Europe. On this picture is Czech Dussak from city Dečín. Design of this kind is specific for Czech and origin is in first half of 15 century in Husitian wars in Czech. In 16 century was term Czech Dussak more wooden training wearpon as initial farmer wearpon. Yep, the picture came from this book, Illustriertes Lexikon der hieb- Stich-Waffen by Jan Sach. Wooden weapons are for training not killing. Aw gee, I so have to disagree with that, mate. Miyamoto Musashi is only the most well known example. The Buddhist Monks who defended Song Shan (Shaolin) Temple from a bandit army in 610 used wooden weapons, and again in 621 when they defeated Wang Shichong at the Battle of Hulao. This battle allowed Li Shimin's father to become the first Tang Emperor. Then in the 1550s, Monks, and not just those from Shaolin, fought and defeated Japanese Pirates on four separate occasions, using mostly wooden poles. These occasions were: The Gulf of Hanzhou in the spring of 1553, Huangpu River Delta in July 1553, Majiabang in the spring of 1554 and Taozhai in autumn of 1555. On these listed occasions, the usual ban on Monks killing was temporarily lifted (well, not so much lifted as tolerated) under the "kill one to save many" philosophy. In the Medieval era the poor didn't fight. So, a dussack isn't the same thing as a dusack, then? That is, a short saber with a Sinclair hilt? Hi Bennison it´s is true that wooden weapons have been used but have you perceived that this threat is about dussaks not polearms. also your occasions are all in east Asia. You should have mentioned the German pheasants war in the 16c. wich was at the right place and the right time. as mentioned before there is not the slightest proof that wooden swords or dussaks were used in battle but a few illustration show That wooden pitchforks were used. To Anders Backlund, in the 16. and17. century was hardly a common sense if this weapon should be called dussak , dussägge, dusak the ortography rules were just evolving. In the text above it is said to be a single bladed curved weapon with blade, grip and a hanguard made from one piece. But there are more complex pieces as far as i know. All this weapons refered as dussacks dusak or so share one thing a Blade shaped like a saber blade but shorter. I think those blade type began its "career" in early 16.c as a cheap pheasants weapon to compared to the "hauswehr" then found very effective and practical and was then adopted by upper classes adding a more secure hilt form to the blade witch was modern at that time, but still calling it the same name . I think so too. From my own little research the Dussack is pretty recognised at Central and Eastern Europe, being a common weapon of past tradition, but much less in Wesatern Europe. There are several specimens in museums while there are non such in the West, as far as I know. This can be viewd in the Czech book mentioned above and also in the great volume Europaische Hieb-und-stich Waffen by Muller, H. & H. Kolling. Attached is a pic of a Dussack from my collection. Apparently identical to the one in the book, but having a nice deep maker's mark. Condition is great, found in Hungary. I agree. The poor certainly did fight on occasion. All in an area, rich and poor, were required for at least home defence in At least England, France and the HRE. I am fairly sure in Italy and Spain it takes places as well for defence. In England this service could easily extend to outside ones county, even at times region. The poor did fight. That said they often were reequipped in England by the Sheriff at the county's expense. Of course when one was organising an army one would try to get soldiers with good arms, armour etc but this was not always possible. Hi Bennison it´s is true that wooden weapons have been used but have you perceived that this threat is about dussaks not polearms. also your occasions are all in east Asia. Well, you know, stick to what you know, right? I saw Miyamoto-sama mentioned, so thought (more hoped really...) a bit of Asia might fit somehow. I had hoped that someone with more knowledge on Medieval Europe, and therefore almost everybody on this forum (although I will catch up to some of you, be warned...), would be able to offer more period and weapon examples. I knew there was definitely some examples out there. Just trying to kick it off. Well, the quarterstaff would qualify as a wood weapon used by the British at the very least and may have had uses in various forms since the first humans picked up a stick. A pilgrims walking staff was actually helpful for walking but some weapons value in trained hands for example. The wooden club as in early mace seems to have had some usage. ( Bishop Odo, if memory serves !? ). Oh, prefering a wooden waster sword for battle or war doesn't seem to have been documented ( At least I haven't read about anything like it: Doesn't mean it never happened that someone used a waster in an emergency or to show off skill or humiliate an opponent in a friendly or not so friendly duel ???). 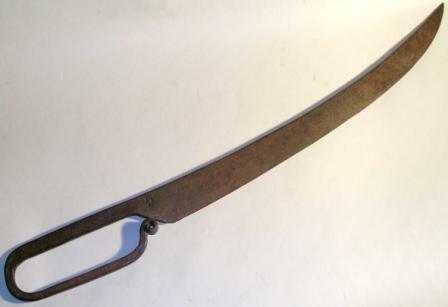 Oh, getting back to the subject of the dussak it looks to me like a weapon that any reasonnably competent village blacksmith would be able to make one of these and that they would be a very use it, abuse it, recycle the iron/steel and make a new one when it was too worn out to use. Fighting weapon only ? Or where they used as utility knives or machetes ? If they started as peasant weapons but became popular a richer peasant might want a better made one and eventually more richly made one might also have become popular. The ways to fight with these must have resembled the way a messer would have been used but maybe some " unique " techniques may have been developed that would have also encouraged the making of better made versions: A rich person or Knight might find a crude dussak below his station and dignity but could get around this by having a dussak in form made to sword or messer standards of quality. I'm just speculating and definately asking questions and not stating facts here. I believe what Steven H was stating and trying to clarify from the original poster was that topic of wooden versions of metal weapons (in this case the training dussack) being used in combat. As Steven says there seems to be little evidence to suggest that wooden training weapons were actually used in battle although as always there were likely rare exceptions (like when someone needs an on-the-spot improvised weapon). Even the accounts of Musashi have to be taken with a grain of salt because as with any account that lacks solid evidence (photos, video footage, physical objects, etc) there is always the possibility of exaggeration and/or lying. This is especially true when it comes to accounts of physical of martial prowess which often differ greatly when viewed on video compared to a eyewitness account. Many of the outlandish claims of 19th and 20th century martial art 'masters' that were later proven to be false are good examples of this. Musashi may well have actually carved a bokken out of an oar while waiting for his duel with Sasaki but there are some holes in the story and without physical evidence we can never really know for certain if the story was just made up to boost his status/reputation or not. Anyway enough of my off-topic rambling. I think pretty much the main reason why wooden training weapons weren't used much in combat (and hence why there are so few accounts) is simply due to other more effective wooden weapons being more easily available. Wooden staves and especially wooden clubs were common and readily available weapons for a large part of Human history. A warclub is not a glamorous weapon but it relatively easy to make compared to a wooden sword and would have likely been a more effective weapon. I am definitely interested in hearing any other evidence or possible ideas of how metal dussacks were used and how common they actually were. I´m sorry Bennison it was not my intention to upset you, of course you are right and like jean suggested why don´t you start a new threat about wooden weapons. Also it would be interesting to discuss why or even if poor fought also in another place. I agree with Jean that the dusak was not only weapon it was a tool also. I think i was a everyday carry around universal tool like the hauswehr light versatile and not so big like a sword or saber which would hinder movement. I don´t think a Pheasant could afford a luxury of a weapon which cannot be used for other things. One important thing is that if it was considered a tool it was easy to carry around without looking offensive or dangerous. But in case of being attack a serious threat to the enemy. The dusak can be drawn very fast then instantly delivering a few slashes which easily cut of hands or fingers an thus making the enemy unable to fight. Like in modern knife fighting a cut in the lower arm region would have caused heavy bleeding making the enemy weaker and could make him Faint or Die within minutes.